The new buses took to the roads in July as part of a switch to a gas hybrid fleet operated by RMA Worldwide Chauffeured Transportation. The vehicles also sport Wi-Fi and use of TransLoc technology to track shuttle locations and provide service updates. 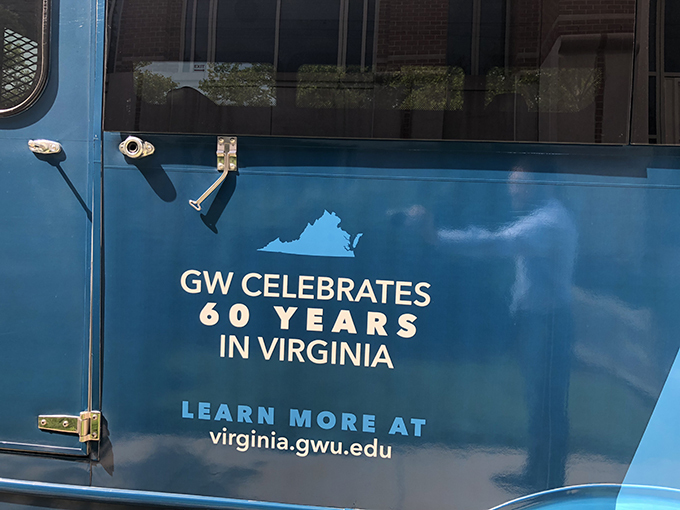 In addition to sporting the official GW colors, the branding promotes GW’s long-term presence in the Commonwealth of Virginia, which started in Hampton Road 60 years ago. Since then, it has also established education centers in both Alexandria and Arlington, Virginia and invested in the establishment of the Virginia Science and Technology Campus (VSTC), a 122-acre Campus located in Ashburn, VA.
A study released in December 2015 finds the University contributes more than half a billion dollars to Virginia’s economy, thanks to its growing Virginia Science & Technology Campus and the education centers. The report, conducted by Chmura Economics and Analytics of Richmond, Va., was the first formal measure of the university’s growth and impact in the Commonwealth. 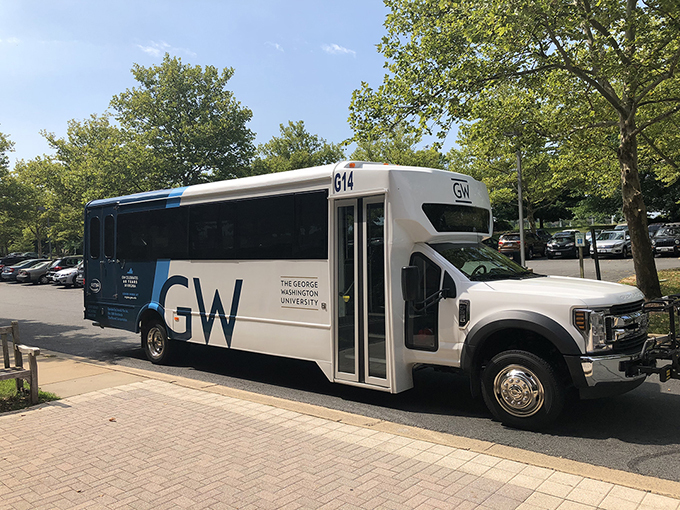 It analyzed GW’s operational spending, research spending and capital investments in Virginia, as well as the university’s employee and student spending and economic benefits for Virginia’s workforce. In addition to the economic contribution, GW supports over 5,275 jobs in the Commonwealth and enrolls more than 1,500 students in Virginia. And with more than 50,000 GW alumni living and/or working in the Commonwealth you are likely to meet one or more of them!